I was born at home, a suburban semi in Whitton, Middlesex, in 1936, “with instruments”, as my mother used to say, and it didn’t mean violins playing. In midwife-speak, I was turned down, a salutary experience for a future writer. Earliest significant memory is a wartime one from 1944: being collected from an air-raid shelter at school and told our home had been destroyed by a V1 Flying Bomb. Miraculously my family escaped — brothers John and Andrew crawled out of the rubble, having survived under a Morrison table-shelter — although our neighbours in the other half of the house were killed. After the bombing we were billeted with a farmer and his family in the West Country, an episode that influenced Rough Cider, my book about the memories of an evacuee. In 1945 a huge crowd packed the White City for the first big athletics meeting after the war, when Sydney Wooderson ran against Arne Andersson. My father took me, but we were among the thousands who didn’t get in. Even so, my interest in athletics was sparked. Later we went to the London Olympic Games. I grew up a fan and cycled to meetings in and around London through the 1950s. But as an athlete I was inept. You’ve heard of the Fosbury Flop. I was a flop before Fosbury was born, which is why I developed into a track “nut” and not a world-beating athlete. Much later, I wrote a bibliography of track and field, an athletics novel and the official history of the Amateur Athletic Association. After Hampton Grammar School, I went to Reading University to study Fine Art and soon switched to English. My towering achievement at Reading was finding my future wife, Jax (known as Jackie Lewis then). Studying was just a bind for us both and we ended with less than brilliant degrees. When asked for a reference, Prof Gordon gave me a generous one, but added in a personal note, “You will now admit that you did no work at all.” Ah, but he couldn’t get enough crime novels to read and was amused years later when I sent him one. National Service followed — as a Pilot Officer who piloted nothing and a Flying Officer who didn’t fly. Teaching RAF boy entrants earned me enough to get married and qualified me to teach in FE, first at Thurrock Technical College, then Hammersmith College. In spare evenings and weekends I tried sports writing. Out of it eventually came The Kings of Distance, my first book. A great thrill, especially when World Sports named it Sports Book of the Year. But how do you follow that? One day in 1969 we spotted an advert for a first crime novel. The prize was £1000. Too tempting to ignore. Encouraged by Jax, I used my knowledge of obscure Victorian athletics, wrote Wobble to Death in under four months. Off-beat, with a catchy title, it won. The book was launched with a 24 hour Wobble for Shelter around Sloane Square. Barbara Windsor started the race and wobbled better than anyone. Almost by default I was a crime writer. Good thing Jax had read some whodunnits and could advise, because I hadn’t progressed much past the Saint. Didn’t appreciate the honour of being reviewed by John Dickson Carr, Edmund Crispin, Julian Symons and HRF Keating. I knuckled down to learn the tricks of the trade and wrote seven more Victorian crime novels. In 1975, I kissed farewell to teaching and went full time. Waxwork, the eighth novel, had a good review in Time magazine, and TV Producer June Wyndham-Davies decided to buy it for Granada. Starring Alan Dobie as Sergeant Cribb and Carol Royle as the woman awaiting execution, it was screened at Christmas, 1979. Two series followed. All the book were dramatised and six new stories were written by my wife Jax and me just for TV. Our audience rose to 12.5 million in 1981 and Alan Dobie and William Simons (as Constable Thackeray) were nominated for Emmy awards. Click on TV, Film and Radio for more. After giving up the day job, I went back to what I knew best. 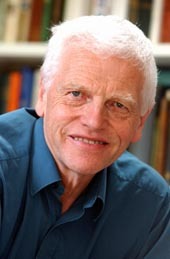 Goldengirl, under the pen-name Peter Lear, was about the exploitation of a brilliant runner aiming to win three gold medals at the 1980 Moscow Olympics. It was filmed starring Susan Anton and James Coburn. Shame about the timing: just before the film was released, the Russians marched into Afghanistan and the Americans pulled out of the Olympics. Not many people know about Goldengirl. Early in my career, Mad Hatter’s Holiday was shortlisted for the Crime Writers’ Association Dagger Awards. The last of the Cribb books, Waxwork, won the 1978 Silver Dagger and in 1982 The False Inspector Dew won the Gold. The Summons (1995) and Bloodhounds (1996) each won a Silver. In 2000, I was awarded the Cartier Diamond Dagger for my career in crime writing and in 2018 the Mystery Writers of America honoured me as their Grand Master. For the full trophy cabinet, click here. In 1991, I faced the new challenge of writing about a modern policeman. Peter Diamond, in The Last Detective, took to the bookstands and had a gratifying reception, winning the Anthony Award for best mystery of the year in America. Diamond has gone on to eighteen other books and a clutch of awards on both sides of the Ocean. More recently Henrietta “Hen” Mallin has been featured, first in a cameo role in The House Sitter, and then centre stage in The Circle and The Headhunters. 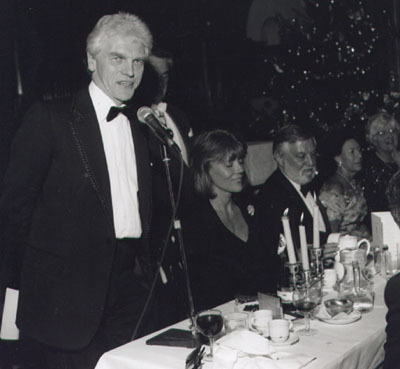 Put On The Spot: In 1990, the CWA had its glitziest Awards Dinner, with Princess Margaret as the main guest, and a galaxy of film and TV stars, among them Diana Rigg, Julie Christie, Francesca Annis and David Suchet. So it was a calamity the evening before when our speaker, John Mortimer, was taken to hospital with a detached retina. CWA Awards Dinner: L to R: Peter, Diana Rigg, James Melville, Princess Margaret, Catherine Aird. "Buried here, with a stake drove through his body, is the wicked murderer, John Proctor, who cut the throats of his wife and child and then poisoned himself, July 6th, 1765." 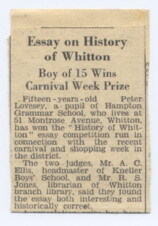 The opening lines of my History of Whitton essay in 1951 show a morbid fascination with crime even at age 15. My first payday as a writer. With Audrey and Leslie Charteris. Our "bombed out" family was short of books. I can recall only two: The Life of Sir Edward Marshall Hall and Alias the Saint. I thought "Alias" had something to do with the Old Testament (I was only eight at the time) and chucked that one aside, but I devoured the Marshall Hall book. He was the outstanding barrister of his age. I read each of the murder trials many times. Eventually I was forced to turn to the book about the saint, who was, of course, Simon Templar, the Leslie Charteris hero. Is it any wonder I became a crime writer? 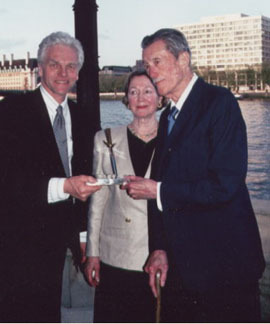 In 1992, when Chairman of the Crime Writers, I was thrilled to present Mr Charteris with the Cartier Diamond Dagger. Murder We Promote: There's a vogue now for performance groups, writers teaming up to hawk their wares through entertainment. The first of them, Murder We Write, grew out of a chat over lunch in 1990 between Liza Cody, Paula Gosling, Michael Z Lewin and me. We agreed that a show might be a painless way to sell books. Mike got on the phone and within weeks we were touring the Mid-West, illustrating the writer's craft with a variety of techniques such as radio drama, audience participation and mime. The show took us up and down Britain as well, to the Edinburgh and Dublin Book Fairs and on TV. 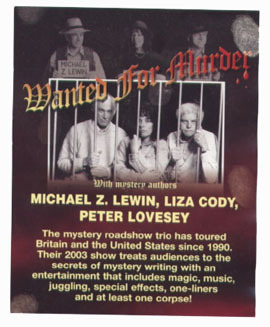 In other tours it morphed into Partners in Crime (just Mike and me); and Wanted for Murder (with Liza), which included magic, juggling and singing. A different way to reach out and sell books. Ten performance groups are now listed in the CWA directory. Fiction In The Family: My brother Andrew Lovesey, a biochemist, wrote The Half-Angels (Sphere Books, 1975), a science fiction fantasy, and would have done more, but died young. Our son Phil Lovesey, "a promising new young British voice" (Time Out), writes psychological thrillers: Death Duties (HarperCollins, 1998), Ploughing Potter's Field (HarperCollins, 1999), When the Ashes Burn (HarperCollins, 2000) and The Screaming Tree (HarperCollins, 2002). In a change of genre, Phil has since teamed up with his wife Jacqui Lovesey to develop a series of illustrated fantasy novels about a magical hare called Matlock. View the official Matlock the Hare website. Our daughter Kathy wisely eschewed literature for commerce and became a Vice President of J P Morgan Chase in New York.